The folks at Wingfield Audio have posted a few more audio samples recorded with the Marantz PMD620 digital audio recorder. It’s not clear whether they were using the internal stereo microphones or a plug-in mic, but what is clear is that this tiny recorder is capable of making some excellent recordings. These aren’t the first PMD620 audio samples to hit the web. As I mentioned in my review roundup, you can find a few more audio clips at Wingfield and Transom. 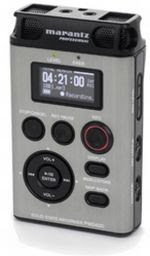 What I’ll never understand is why manufacturers like Tascam, Marantz, Sony, Edirol, and Zoom don’t include audio clips on their own product web sites. Sure, you’d have to take them with a grain of salt since the recordings would probably have been made under ideal circumstances (like in a soundproof booth), but it’d give us a general idea of how these recorders sound while we’re waiting for 3rd party reviews. Actually, I’m wondering why anybody *does* post sound samples on the web. It’s like watching lord of the rings for the first time via streaming realplayer. Sure the original is amazing, but you’re trying to convey it through a vastly inferior medium – in this case someone’s cheap computer speakers. The simple truth is that not everyone can walk into a music supply store and pick up a high quality digital audio recorder in person after testing one out for a while. While MP3 files uploaded to internet sites are far from ideal, they at least give you a rough idea of how well a recorder performs. For example, if you listen to the publicly available audio samples recorded using a Zoom H2 and compare them with the audio from a Sony PCM-D50, you’ll notice a huge difference in audio quality and preamp-related hiss. The simple truth is that not everyone can walk into a music supply store and pick up a high quality digital audio recorder in person after testing one out for a while. While MP3 files uploaded to internet sites are far from ideal, they at least give you a rough idea of how well a recorder performs. For example, if you listen to the publicly available audio samples recorded using a Zoom H2 and compare them with the audio from a Sony PCM-D50, you'll notice a huge difference in audio quality and preamp-related hiss.